Soft drinks (also called pop, sodas, fizzy drinks) generally refer to flavoured non-alcoholic drinks. Diet soft drinks, which are artificially sweetened are often a popular option for people with diabetes as they generally have an insignificant effect on blood glucose levels. As a general rule, people with diabetes wishing to have a soft drink will usually want to choose diet soft drinks over sugary versions. Exceptions to this general rule are if someone with diabetes actively needs to treat or avoid low blood sugar levels developing as a result of medication such as insulin. 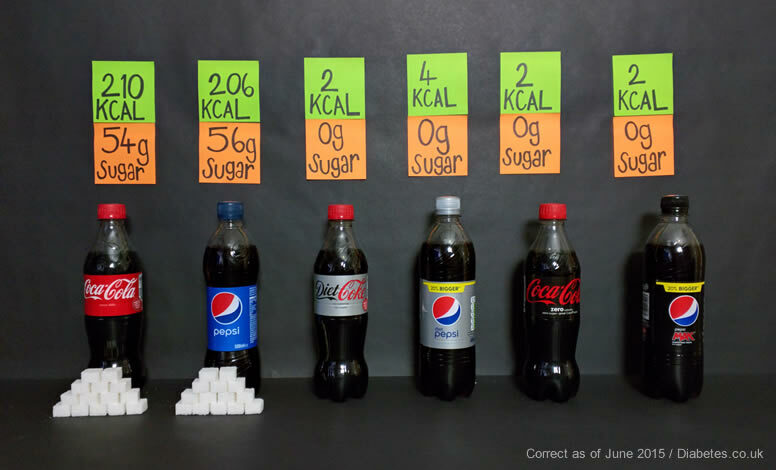 The majority of diet drinks have no sugar and should not raise blood sugar levels. However, it is worth checking the carbohydrate value on the packaging if you are unsure or are trying a new diet soft drink. Most bars and restaurants in the UK these days serve at least one diet soft drink. Diabetes.co.uk is aware that people with diabetes are occasionally served full sugar soft drinks accidentally by bar or restaurant staff. This is more likely to happen in loud or busy environments. Artificially sweetened soft drinks are often referred to as diet drinks because the sweeteners used are very low calorie. 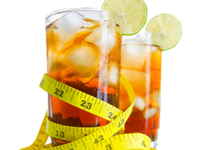 It would make sense to assume that low or zero calorie drinks would not contribute to weight gain but some research studies have indicated that diet drinks may be associated with weight gain. One theory is that artificial sweeteners help to promote cravings for sweetness and cause people to eat sweeter foods. A counter argument is that there may just be a general trend that people who already have a less healthy diet may have a higher tendency to consume diet drinks. Research indicates that sugary soft drinks are linked with type 2 diabetes and research indicates that there may also be an association between artificially sweetened beverages too. A French study, published in 2013, even indicated that the risk of type 2 diabetes may even be higher for those that regularly consume diet soft drinks than people that consume sugary versions. The researchers note that information on the participants’ diets could not be closely monitored and it is therefore not possible to conclude that diet soft drinks were a cause of type 2 diabetes. There has been a lot of debate about the safety of sweeteners with some health campaigners taking the view that they can lead to a range of problems ranging from depression to digestive disorders and the aforementioned type 2 diabetes. In response to the concerns about safety, pro-artificial sweetener lobbying groups such as the Calorie Control Council have funded studies and conducted PR campaigns to reassure consumers. Extensive research has been carried out to assess the safety of artificial sweeteners but it is difficult to draw conclusive findings from dietary research about long term safety and particularly to distinguish between associations and causation for health problems. Read more about diabetes and maintaining a healthy lifestyle. Diet soft drinks causing heart attacks?